Mousepickle’s newest iOS application takes the gameplay from Sea Snake to a new, more challenging level. Moon Mamba is stripped back to the essentials (there are no player-selectable difficulty levels; the game is always difficult) and the speed dial has been turned right up! 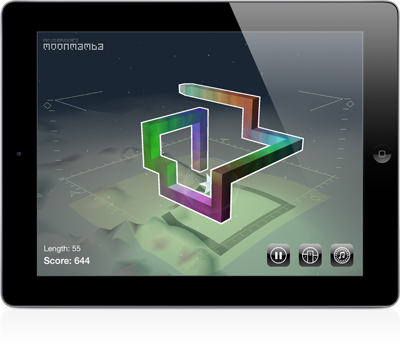 You can read more about Moon Mamba, and see brief instructions on how to use it (although the gameplay is so simple that you’re unlikely to need them). Thanks as always to the tireless efforts of friendly testers, reviewers, and suggesters-of-features; in particular to Paul S for his feedback on early versions. Where applicable, original work on this site, created by Mousepickle Limited, is licensed under a Creative Commons Attribution-Noncommercial-Share Alike 3.0 Unported License.